It’s been a while since I last did a Nails Of The Day post as I’ve been wearing acrylic nail extensions with a french tip for months now. I’m actually letting my extensions grow out naturally, before I get a full new set on for my holiday, rather than getting them soaked off. I just keep cutting them down with a nail tip cutter, buffing them with a purple block and filing them squoval with a boomerang file before painting them. I’ve really been enjoying wearing nail polish again and there’s no colour I’ve enjoyed wearing more than this one. I lusted after this polish in Sally’s for months before I finally bought it and I’m so pleased I did. It has quickly become my most loved OPI polish and one of my favourite nail polish shades of all time. Elephantastic Pink is a bright but very wearable coral pink which becomes completely opaque after 2 coats and dries in very good time. The formula is smooth and the polish is creamy making it a dream to apply. I’d say it’s on par with my Models Own in terms of drying time and the formula is actually even better than Models Own which is saying a lot as they’re my favourite nail polish brand. It’s glossy, quite gel looking and very flattering, particularly with a tan. After the 2 coats of this polish, I apply my favourite top coat, RapiDry by OPI to and an even glossier protective layer. The result? 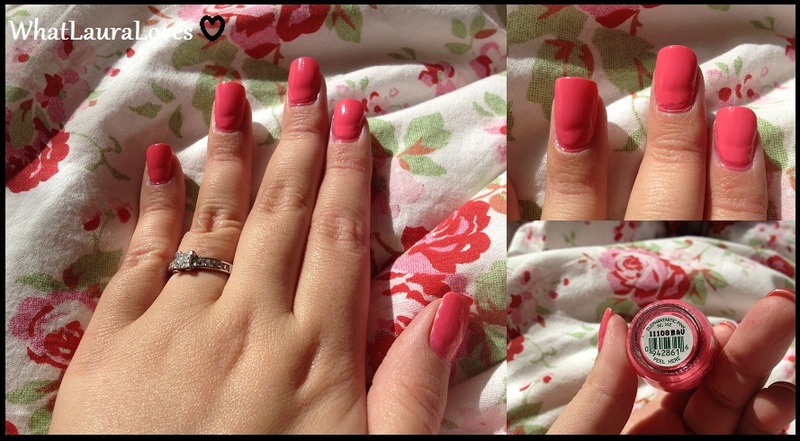 Shiny, beautiful, summery nails. Without a top coat, I find that this polish lasts about 2 days without chipping on natural nails and about 4 days on acrylics. With the RapiDry top coat, it easily lasts for at least one week without chipping on my acrylic nails. It’s one of those shades that goes with so much of my wardrobe from my bright and floral summer dresses to my black, beige, white and grey work wear. It adds a subtle pop of colour to a dull outfit and doesn’t offend in the office. By the way, just as a side note: I’m not entirely sure what elephants have to do with pink. When I was younger my daddy always used to tell me that elephants paint their toe nails red so that they can hide in cherry trees…. so who knows what pink is for!? Don’t you just love the colour of this polish? What OPI shades would you recommend?